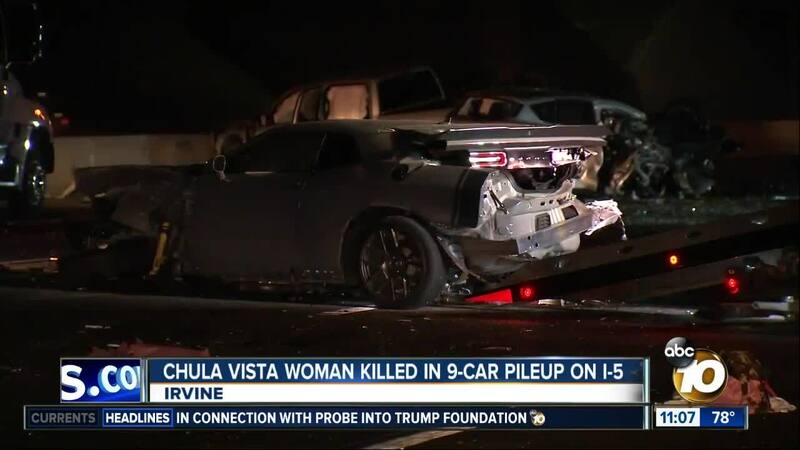 A Chula Vista woman was killed and nine people -- including three children -- were injured Thursday after a multi-vehicle pileup crash on Interstate 5 in the Irvine area. 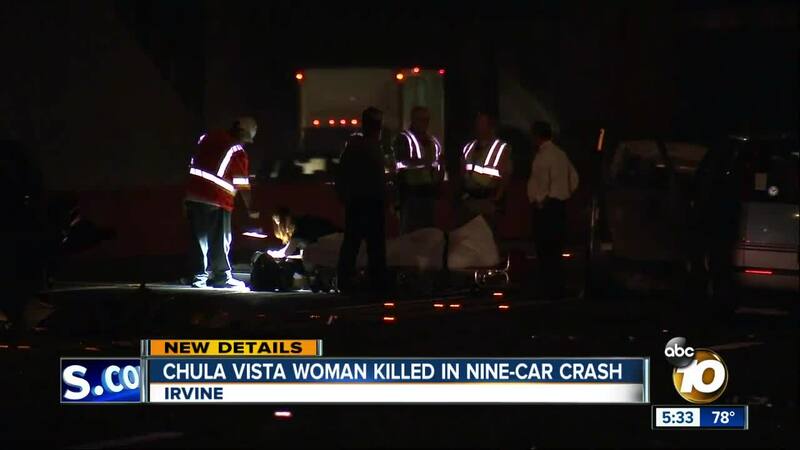 (KGTV) - A Chula Vista woman was killed and nine people -- including three children -- were injured Thursday after a multi-vehicle pileup crash on Interstate 5 in the Irvine area. According to the California Highway Patrol, the crash occurred at around 1:25 a.m. on southbound I-5 near the Irvine Spectrum Center. The CHP reported that at least nine vehicles were involved in the wreck, but the cause of the crash is under investigation. ABC7 in Los Angeles reported that the one person killed in the incident was a 24-year-old woman from Chula Vista; her name was not released. A six-month-old boy was among the victims, according to ABC7’s report. The baby, believed to be the victim’s son, is expected to survive after suffering what CHP officials call “moderate to major injuries.” 10News learned family members are with the baby at a Mission Viejo hospital. Two other children from different vehicles were also hospitalized with injuries of unknown severity. A 22-year-old Nevada man was arrested on suspicion of DUI, ABC7 reported . Authorities believe he caused the chain-reaction crash. An Uber driver told ABC7 that his Toyota Prius -- which had no passengers at the time -- was the first to be struck by the suspect’s Dodge Challenger. He said 10 minutes passed before additional vehicles became involved in the pileup.